The Global Volcanism Program has no activity reports for Inierie. The Global Volcanism Program has no Weekly Reports available for Inierie. The Global Volcanism Program has no Bulletin Reports available for Inierie. 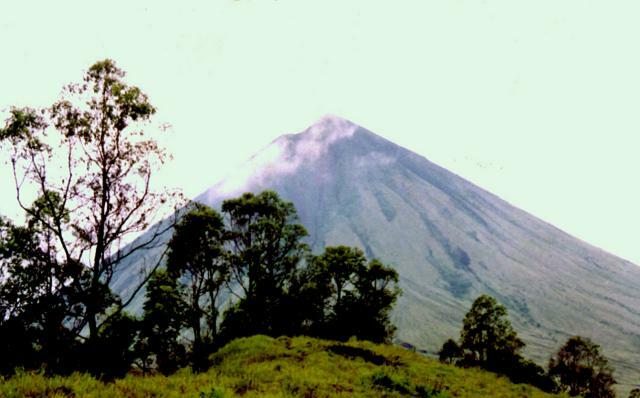 The symmetrical Gunung Inierie volcano in south-central Flores overlooks the Sawu Sea, and at 2245 m is the highest volcano on the island. A small steep-walled crater is oriented E-W immediately east of the summit of the conical stratovolcano, whose upper slopes are unvegetated. A somma wall lies west and NW of Inierie (also known as Rokka Peak). A NNW-SSE-trending chain of volcanoes extends from across a low saddle to the NE of Inierie, including 1400-m-high Wolo Bobo. These are part of the Pleistocene Bajawa cinder cone complex, which lies north to east of the volcano. A column of "smoke" is sometimes visible from the crater, as occurred in June 1911. The age of the latest eruption is not known, although the volcano was mapped as Holocene, and an eruption of Wolo Bobo was radiocarbon dated at about 10,000 years ago (Nasution et al., 2000). Hot springs are located at the northern flank of the volcano, and additional geothermal areas are located to the east and NE. Nasution A, Takashima I, Muraoka H, Takahashi H, Matsuda K, Akasako H, Futagoishi M, Kusnadi D, Nanlohi F, 2000. The geology and geochemistry of Mataloko-Nage-Bobo geothermal areas, central Flores, Indonesia. Proc World Geotherm Cong 2000, Kyushu-Tohoku, Japan, May 28-June 10, 2000, p 2165-2170. There is no Deformation History data available for Inierie. There is no Emissions History data available for Inierie. 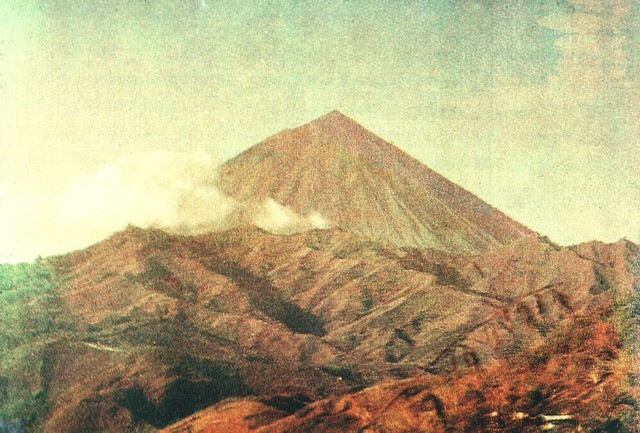 The symmetrical Gunung Inierie volcano, seen here from the SE, is at 2245 m the highest volcano on Flores Island. The unvegetated cone of Inierie here rises steeply above surrounding hills, which are home to the Malay/Melanesian Ngadi, one of the most traditional native peoples on Flores. A column of "smoke," as occurred in June 1911, is sometimes visible from the crater of Inierie, which is on the eastern side of the summit. 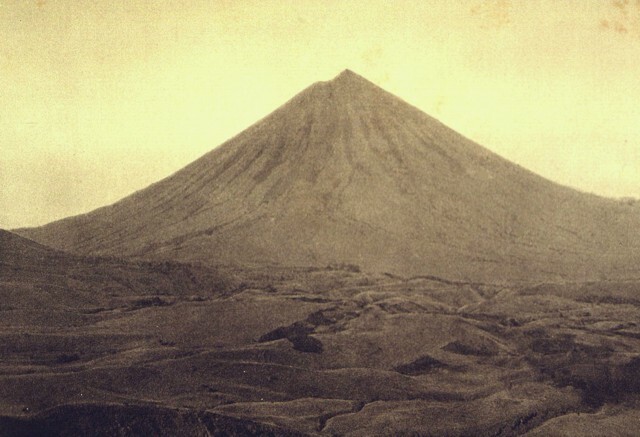 The beautifully symmetrical 2245-m-high cone of Inierie, the highest volcano on Flores Island, rises above hilly terrain of the Bajawa Highlands below its northern flank. Inierie has an elliptical crater immediately east of its summit that occasionally produces "smoke" columns. 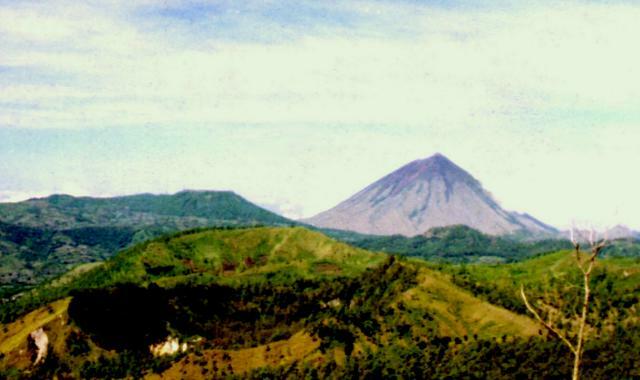 The symmetrical Gunung Inierie volcano, seen here from the north, is at 2245 m the highest volcano on Flores Island. The unvegetated cone of Inierie here rises steeply above surrounding hills, which are home to the Malay/Melanesian Ngadi, one of the most traditional native peoples on Flores. A column of "smoke," as occurred in June 1911, is sometimes visible from the crater of Inierie, which is on the eastern side of the summit. There are no samples for Inierie in the Smithsonian's NMNH Department of Mineral Sciences Rock and Ore collection. Large Eruptions of Inierie Information about large Quaternary eruptions (VEI >= 4) is cataloged in the Large Magnitude Explosive Volcanic Eruptions (LaMEVE) database of the Volcano Global Risk Identification and Analysis Project (VOGRIPA).